06/09/2017 - New major release CRYSTAL17! CRYSTAL is a general-purpose program for the ab initio modeling of crystalline solids. It computes the electronic structure of periodic systems within Hartree Fock, density functional (LDA, GGA, mGGA) or various hybrid approximations (global and range-separated hybrids) and allows users to perform consistent studies of the physical and chemical properties of crystalline solids (3D), surfaces (2D), polymers (1D) and molecules (0D). CRYSTAL with its massive parallel (MPP) extension is one of the few software products able to address cutting-edge research projects on HPC architectures. MPPcrystal has been designed to work efficiently on thousands of processors. It can treat very large unit cell systems with large memory requirements, as matrices in the reciprocal space are fully distributed over the processors. An excellent scalibility in terms of both speed-up and memory usage has been obtained up to more than 8000 processors, as exemplified below. 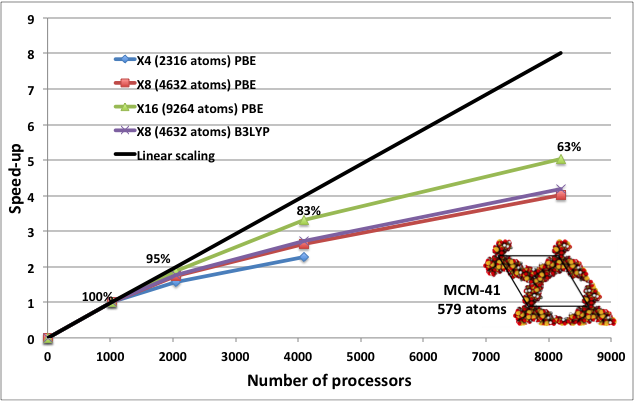 Speed-up as a function of the system size for different supercells of a model of the all-silica mesoporous material MCM-41 (41x41x12 Å unit cell, 579 atoms) Results are reported from X4 (2316 atoms, 31024 AOs) up to X16 (9264 atoms, 77560 AOs) for PBE GGA and B3LYP hybrid functionals. Memory scaling as a function of the system size for an increasing number of processors (PBE GGA functional). All calculations were carried out on SuperMUC (LRZ, Germany), a HPC IBM System x iDataPlex powered by 16 Intel cores per node running at 2.7 GHz, with 2 GB/core. Every run consists in an total energy calculation (SCF). Matrix diagonalization is well balanced because many processors are involved in the diagonalization of one matrix. 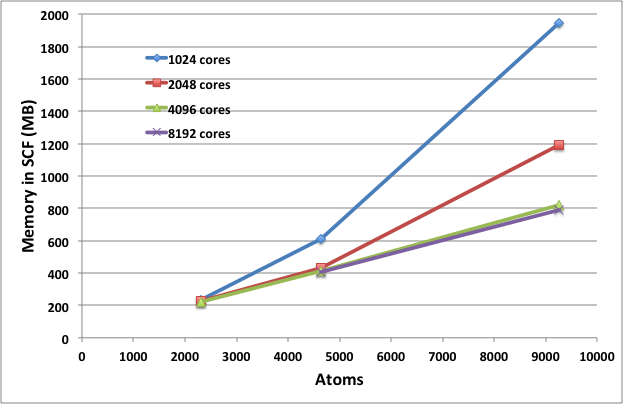 Memory requirement per processor decreases with the number of processors because data are distributed to processors. I/O is limited to reading the user’s input deck and writing the output files with the results of a job. Such features make it particularly suitable to be run on High Performance Supercomputing facilities. The excellent performance of CRYSTAL MPP allows users to successfully compete to access high supercomputing resources within international projects.